Leslee's Creative Inspiration: Getting Started Now! Every year I vow to not wait until November to get started on my Christmas cards. Well, this year, I've started early. Just maybe I'll have all I need completed by December. If not, this will be a super card to mass produce! Before I get to the details, I have to give credit for this awesome layout to Susan Raihala (aka LateBlossom). I've been blog stalking her for some time now. She has a great blog, Simplicity, that you must check out. Susan is queen when it comes to keeping cards clean and simple!! Yes...kudos to Susan!! On with the details... It's super simple, no layers and only two stamps and colors. The card base is Very Vanilla. 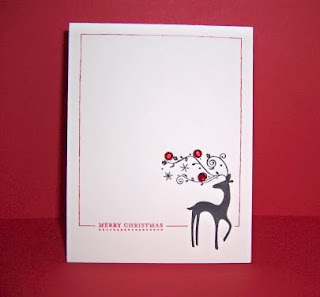 Dasher is stamped in Basic Black Craft. The sentiment is again from Teeny Tiny Wishes. It's stamped in Real Red Craft. I then used a ruler to marker the frame in Real Red. A few red jewels to bling up Dasher and it is done! Marker Tip: Make sure your marker/pen is in good working order. Otherwise, your frame may end up with blobs and stop/start points. Yes, my new red marker is on order. Thanks for dropping by today. I hope you've been inspired to get your holiday projects started early. And take a moment to check out Susan's Simplicity blog! Wow, thanks, Leslee! 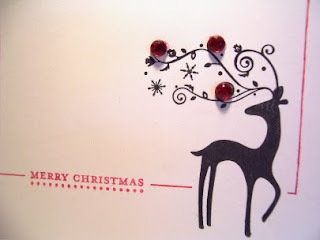 Your card is stunning and those red jewels are the perfect accent for it!